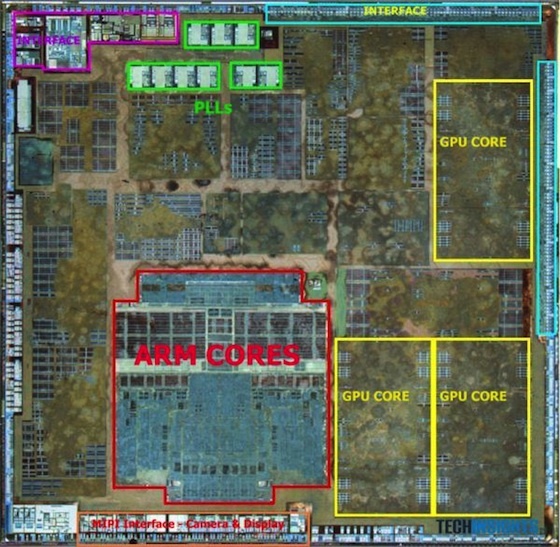 As part of its report on Apple's custom ARM chip design for the A6 found in the iPhone 5, AnandTech speculated that the improved graphics performance in the iPhone 5 was achieved through the use of a triple-core PowerVR SGX 543MP3 graphics processing unit (GPU) rather than doubling the clock speed of the dual-core SGX 543MP2 found in the A5 or using the quad-core SGX 543MP4 found in the A5X for the third-generation iPad. The [SGX 543MP3] is sort of the best of both worlds. You don't take a huge die area penalty and at the same time don't run at a significantly higher frequency, and you can get to that same 2x value. The image above shows two 32-bit LPDDR2 memory channels and three GPU cores. We're likely looking at a PowerVR SGX 543MP3 running at 266MHz. More information and analysis on the A6 will undoubtedly be forthcoming as UBM TechInsights continues its work, but the first glimpse inside Apple's custom chip design for the iPhone 5 demonstrates how the company has been able to balance processing power needs with die size constraints to achieve significant performance gains for the iPhone 5 compared to its predecessors. And yet somehow has worse performance. Looks like a Maps screenshot to me. Why does it seem like every post about the iPhone 5 has a retaliation about how the Galaxy S3 is superior, and every post about the S3 has people spouting about the iFive? When I saw a poll some time ago on the MacRumours demographic, it seemed like the majority of us were aged 20-40. Why, then, are we acting like the kids that used to - and unbelievably still do - make "Xbox/PS3 IS BETTER" comments? Pick the piece of technology that works in your favour, and go your separate ways people. Are there any Mac rumors at 'MacRumors'? Maybe it's time for a name change. GLBenchmark results show it is around 2.4x as fast as the A5's GPU. Here are some other GLBenchmark scores for reference, higher is better. Yes, this is awesome...so you get an extra core but it's still SLOWER and uses MORE POWER than the iPhone 5!!! Cool, Slower and consumes more Voltage...usually you only get ONE of those together!!! I appreciate MacRumors reporting on stuff like this. They do focus mostly on rumors but this kind of stuff is interesting. I mean if you like rumors, you will like reading this stuff.